Summary Intel Berryville Atom dual-drive RAID 1 NAS focused on home users running new Thecus OS. Thecus recently added two more Intel Berryville-based (actually Evansport platform, which is based on the Berryville SoC) NASes to its NAS line. Aimed at the home multimedia user, the two-bay N2560 and four-bay N4560 are basically upgraded versions of the N2520 and N4520 models announced back in March. The main difference is a faster Intel CE5335 Atom processor (1.6 GHz vs. 1.2 GHz) and double the RAM (2 GB) on the two-bay N2560. Both configurations are BYOD. The two-bay N2560 is set to list at $339, while the four-bay N4560's MSRP will be $519. Both products aren't going to start shipping in the U.S. until October, so we're a bit ahead of the game for a change with this review. The Thecus N2560 front and rear panel callout diagram below shows a good number of lights and interesting connections. On the rear we have two USB 2.0 ports, a Gigabit ethernet port, HDMI to use the Thecus as an HTPC, and a SPDIF digital audio out jack. There is no eSATA port. The front of the N2560 has a USB 3.0 port and a myriad of LED lights for different functions and alerts. For those of us who like blinking lights because it helps us feel like we know what's going on inside the NAS, the Thecus will be a dream come true. There is status for both drives, status for LAN and status for Power, Diagnostics and USB. Thecus has even lit up its logo on the side of the NAS as an additional boot-time status LED. There isn't much to the main board in the Thecus N2560. In the image below, you can see the heatsink covering the processor and the RAM soldered to the board. In this picture you can see the heatsink removed from the Atom processor. Note that it does not have a companion device, which helps to hold down manufacturing cost. The key components for the Thecus N2560 are summarized in the table below along with Buffalo's TS5200, which is based on a dual-core Atom D2550. We used two WD Red 3 TB (WD30EFRX) drives generously provided by WD for testing. Power consumption measured 20 W with the two drives spun up. Drive spin-down was set for 30 minutes, but it never kicked in, even when we pulled the Ethernet connection. So we could not measure "power save" consumption. Noise of the NAS is classified as low, with just a low "woosh" coming from the fan. 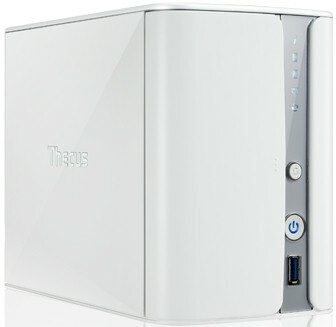 The Thecus N2560 is the first Thecus NAS we've had a chance to review with the new ThecusOS 6. It's not a huge makeover from Thecus' previous OS, but Craig Ellison will be doing a full feature review of it in the coming weeks. If you simply can't wait for Craig's review, Thecus provides an OS6 Live Demo that you can navigate around in and take a closer look. Below you can see a screen capture of the Desktop. Thecus OS 6 tries to emulate the "desktop" look that Synology, NETGEAR and QNAP have adopted in their OSes. But its more closely resembles Buffalo's weaker attempt at a revamped OS with the ability to open only one window at a time. Thecus told us that the "icon based" GUI design is not an attempt to move to a multi-window "desktop" design. They said user feedback guided them to "create a simpler UI for novice users". The other key point to note is that OS 6 doesn't (yet?) support all of the apps supported on OS 5 based NASes. For example, using Thecus' new App Center, the OS 5 32 bit based N2200EVO supports 60 apps, while the OS 6 32 bit based N2520, N2560, N4520 and N4560 support only the 20 apps shown below. Also note that the 2520 and 2560 don't support iSCSI, but the 4520 and 4560 do.